The ninth chancellor in SIUE’s history, Pembrook earned an associate’s degree from Lewis and Clark Community College before achieving both a bachelor’s and master’s in music education/piano performance from SIUE in 1978 and ’80, respectively. He earned a doctorate in music education from Florida State University in 1984. 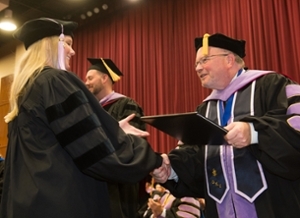 Photo: Erin Gunderson receives her doctor of dental medicine degree from SIU SDM Dean Bruce Rotter.